custom painted Triumph Silver Jubilee – Here are some pics Shane sent through to me of his custom painted triumph silver jubilee bike, custom painted here at Alison Arts. We custom painted and hand pin striped this Triumph Motorcycle for him a little while back in the restored original style. Shane has now got it all complete, back to its new 1977 appearance and on club rego ready to roll. Congrats Shane on a great finished bike. The 1977 T140J was launched as a limited edition of 1,000 in US and an additional 1,000 in UK specification (plus 400 for Commonwealth export) of the T140V, produced to commemorate the 1977 Silver Jubilee of Queen Elizabeth II. 2 The idea originated with Lord Stokes who was Chairman of British Leyland and working as a consultant to the Meriden Co-operative. A silver finish with red and blue lining was used and was matched by a blue saddle with red beading. Primary drive, taillight housing and timing covers were chrome-plated and the wheel rim centres were painted and lined. US-version side panels had “One of a Thousand” written under Union Jack flag stickers, UK-version side panels had “Limited Edition”, while the remaining 400 Commonwealth export bikes were badged “International Edition”. Quickly established as a collectors item, each machine was supplied with a unique certificate of ownership. Launched in 1979 and designed by Triumph’s Tom Higham, the Triumph T140D Bonneville Special was a styling exercise inspired by the Yamaha XS 650 Special. Several T140D features such as the top-mounted rear disc caliper and revised grabrail became standard on the T140E. The Bonneville Specials were finished in gold-pinstriped black with a stepped seat and seven-spoke US-made Lester mag-alloy wheels and a tuned two-into-one exhaust for the US market. The T140D had polished fork sliders and a shortened chrome mudguard fixed in place by its central bracing strip. 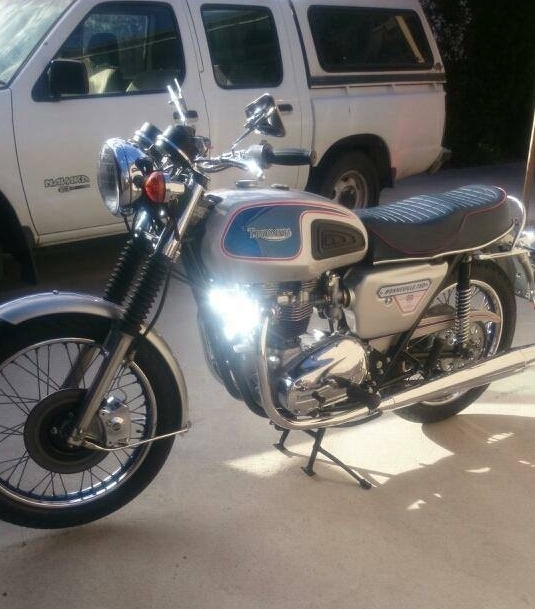 The Bonneville T140ES was the electric start or ‘Electro’ Bonneville. Launched in 1980 and designed at Meriden by Brian Jones, the electric starter was fitted at the rear of the timing chest where the magneto had been located on the original 1959 Bonneville T120. Optional on all Triumph models following its introduction upon the ‘Executive’, electric starting was however standard on all Royal Wedding, T140AV, TSS and TSX models.